Monday - Friday 7:30am to 9:30am. 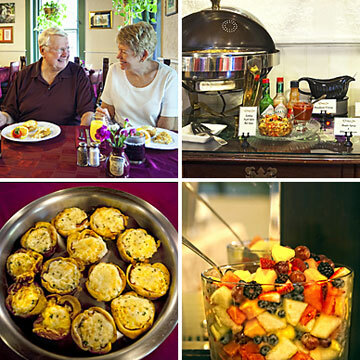 Guests enjoy breakfast in the Inn's dining room, in their guest room, on a balcony, or in the courtyard. Brunch... On Saturdays, on Sundays, and on the morning after a night when holiday rates are charged, a special extended Brunch is served until 10:30am. 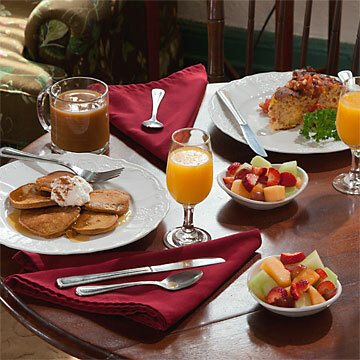 Special complimentary Champagne Mimosas and make-your-own Bloody Mary's are also added to the offerings. Please note that the Holiday Brunch is served on the morning after the evening which has been charged at our "holiday" rate; for example, the Thanksgiving Holiday Brunch is served on Friday morning for guests who stayed with us on Thanksgiving (Thursday) night. Our complimentary Evening Social Hour, held from 5:00pm - 6:00pm daily in the dining room or in the courtyard, allows a delightful opportunity to meet other guests. Enjoy a different specialty appetizer daily, such as our Antipasto Tray with homemade Crostini, or Zesty Hummus with House Baked Pita Chips. Assorted bottled wines and mixed drinks and cocktails, including ones made using the local St. Augustine Distillery Gin and Vodka, as well as our signature St. Francis Sunset, are available for purchase. 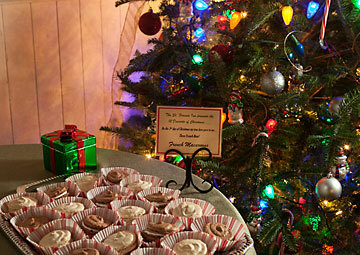 Decadent Evening Desserts, homemade at the Inn, are offered nightly from 8:00-9:30pm. The variety ranges from tall layered cakes to fresh fruit pies and crisps, from rich chocolaty brownies to chewy bars, from tall ice cream sundaes to chocolate fondue. During the Twelve Days of Christmas, our chef's creativity echoes the theme, with specialties like Poached Pears with spiced wine sauce and vanilla ice cream, or a Turtle Dove Cheesecake with caramel, pecans, and Dove chocolate. Indulge! The Inn's swimming pool is a private hideaway - great for cooling off on a hot day. 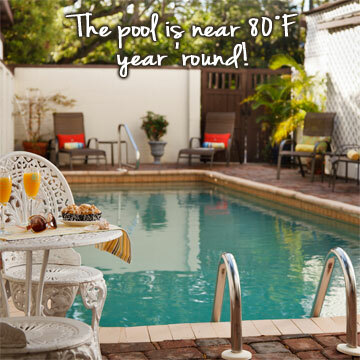 The pool water is temperature-controlled for maximum swimming comfort every month of the year, maintaining a temperature of about 80°F. Poolside is a great place for lounging with a good book, catching up on your emails, or devouring some Inn-baked cookies and iced tea. We also have aqua exercise equipment for guest use... good for working off the treats you eat during your stay. Guests love our complimentary Specialty Coffee Bar, offered from 7:30am until noon. 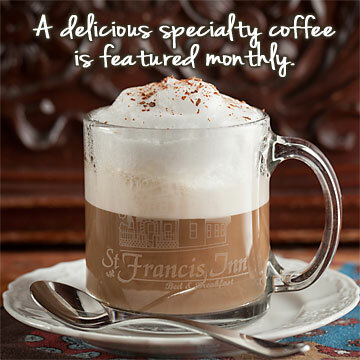 Espressos, lattes, and cappuccinos are individually made to order, with seasonal specials like Pumpkin Spice, Irish Cream Latte, or Chocolate Bianco Latte. Beverages such as house blend regular, decaf, flavored coffees, hot chocolate, ice tea, assorted hot teas, soda, and bottled water are offered all day. 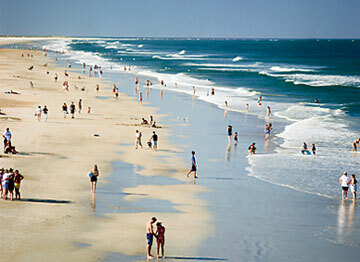 Inn guests are invited to enjoy a visit to nearby St. Augustine Beach. We'll set you up with beach towels, beach chairs, off-street parking, a shower and other comforts for a lazy day on the beach or for walking part of the 14 miles of beautiful sandy beach. 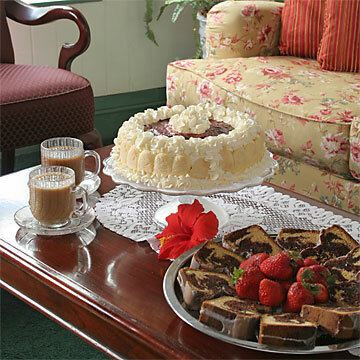 Speak with our innkeeper to make arrangements. Click for beach afternoon details! Feel like a kid again! 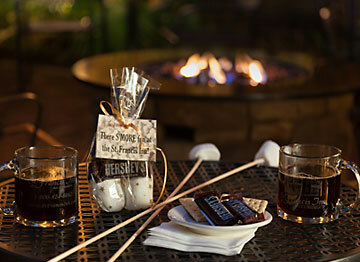 Complimentary ingredients for make-your-own S'mores have become one of our most popular free guest amenity! Gather 'round the courtyard gas fire pit between 8:00 - 9:30pm nightly (weather permitting) and savor the graham cracker, marshmallow and melted chocolate bar concoction. If you've never made a S'more, you are in for a big treat... you'll want 'some more', which is how they got their name. 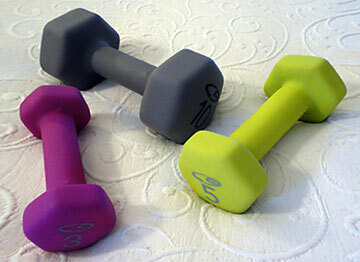 Stay fit during your stay at St. Francis Inn. We have a variety of exercise equipment and fitness DVDs for your complimentary use. Choose from fitness items to use in the privacy of your room as well as aqua fitness equipment for a workout in our temperature-controlled swimming pool. See more detail on fitness options and how to reserve in advance. Everyday is special, but seasonally we find reason to celebrate and surprise our guests at St. Francis Inn, especially with Culinary Treats. In summer we make our own fresh salsa, great on breakfast eggs. On the Fourth of July, enjoy our old-time BBQ with all the fixin's. Evening Desserts often reflect the holiday theme, such as French Macaroons on the 3rd Day of Christmas, or Tres Leche Coconut Cake on the 8th Day of Christmas! 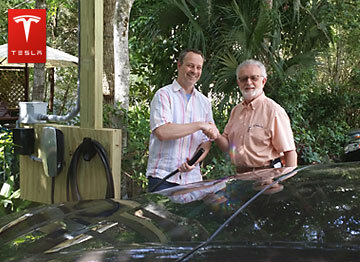 Owners of Tesla Model S and other electric cars can now recharge during their stay. Two complimentary Tesla/electric vehicle charging stations and designated parking spaces are located in the Inn's private parking lot. The charging station has been installed at St. Francis Inn through the Inn's prestigious membership in the Select Registry™ group of premier lodging properties. Plush white terry guest robes, monogrammed with the Inn's logo, are provided in your guest room, for you to snuggle up in after a bath or help you warm up by the fireplace. 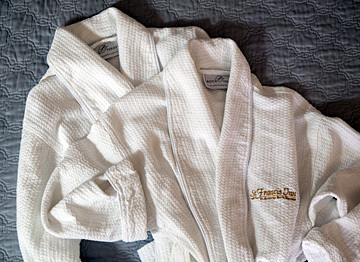 You can wear the robe to the swimming pool during your stay at St. Francis Inn. They are so snuggly, many guests want their own to take home, so we offer them for sale in our gift center - a great memento of your vacation! 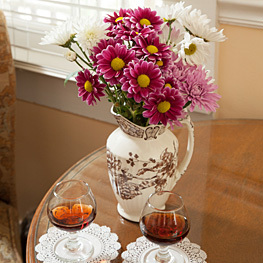 Complimentary fresh flowers and a sherry decanter and snifters greet guests in their room or suite upon arrival. 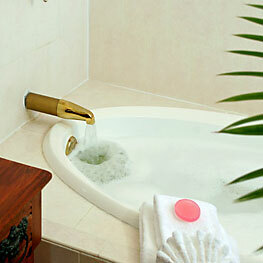 Relax and enjoy these special treats in privacy and comfort during your stay. 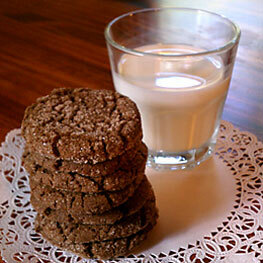 Chocolate snickerdoodles are just one of our guests' favorite varieties of Inn cookies, baked daily for guests to help themselves. Snack on complimentary fresh fruit, like apples and oranges, during the day too. Private complimentary Guest Parking is conveniently available during your stay at the Inn. Our lot is just steps from the Inn entrance, across St. George street, a one-way street with light traffic. 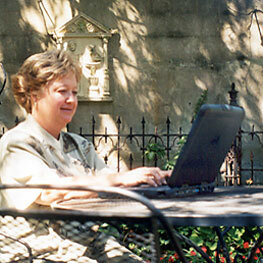 Anywhere on our property, high speed wireless internet is available. Relax and connect from wherever you feel most comfortable: your guest room, the living room, a balcony, the courtyard garden, or poolside. Complimentary bicycles are available for Inn guest use. 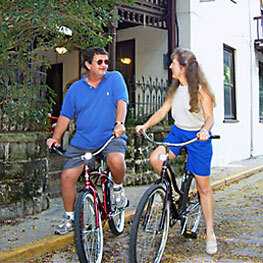 This is a great way to tour the Old City and take in all the charm, sites and history of Saint Augustine. 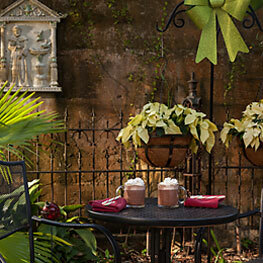 The Courtyard, with its award-winning tropical gardens, is a relaxing oasis for guests, shaded by giant live oaks. It's often the choice for our daily Evening Socials too. Each private guest bathroom has soap and conditioning shampoo. A hair dryer, laundry bag, ironing board and iron are also in each accommodation for guests' use. Keep in shape during your stay. We have Fitness DVDs and a DVD player which you can use in the privacy of your guest room. Check with Innkeeper for what is currently available. 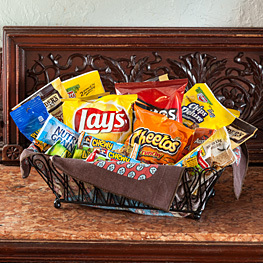 A complimentary Night-Time Snack Basket of chips, crackers, and snack bars is left for hungry guests in the lobby after the front desk closes at night. Help yourself during the wee hours when you get the munchies. Our guests have complimentary access to a state-of-the-art health and fitness center. 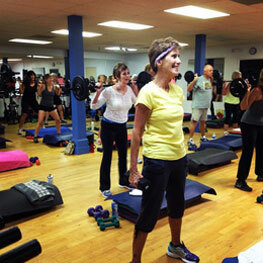 Anastasia Fitness Club is just a short drive onto Anastasia Island. Please speak with your innkeeper to obtain your pass and directions. Guests have complimentary admission to the St. Augustine Lighthouse and Museum plus discounts on purchases in the gift shops. 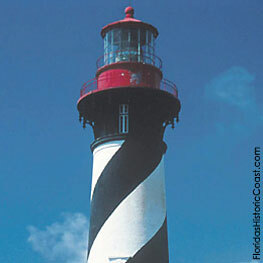 The distinctive Lighthouse is just a short drive from the Inn. Please see our innkeeper to obtain your tickets and directions. 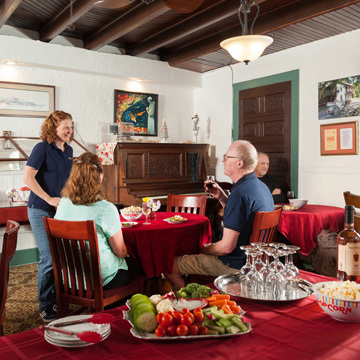 As our guest, enjoy a 50% discount on admission to the nearby Oldest House Museum - one of St. Augustine's finest treasures of local history. 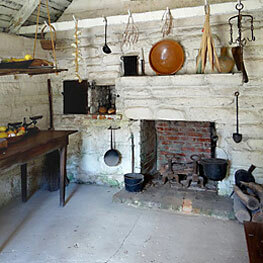 The Oldest House is just steps away from St Francis Inn, east on St. Francis Street.